One of the main ingredients of a cruise is the food! On board Sealife we serve meals which are a delightful combination of classic and modern pantries, prepared on board with careful attention to detail. Many of our ingredients come from the west coast of Sweden so both the fish and seafood are fresh from the sea. Everything we serve is prepared in the modern and well-equipped kitchen on board Sealife. We plan the meals together with our guests. The choice is yours if your requirements are a seafood buffé in a more casual atmosphere or a formal three course dinner served with accompanying wines, coffee and liqueur. 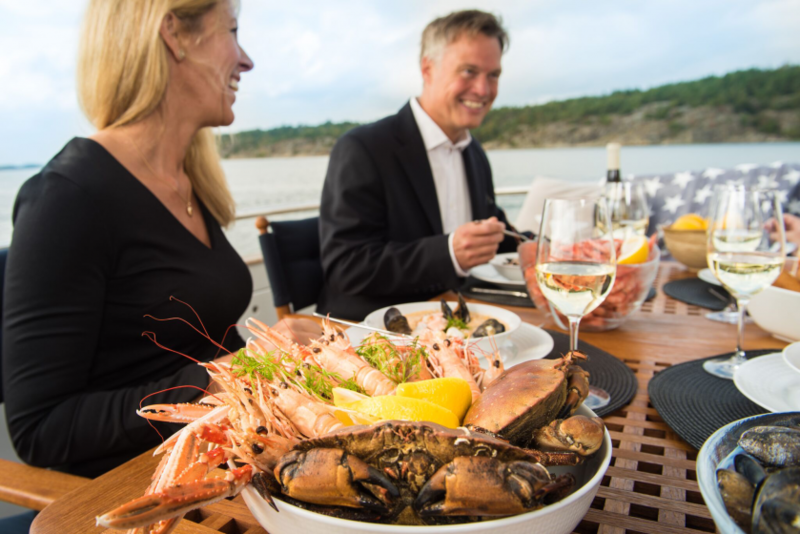 If you choose to take one of our champagne cruises, a delicious range of mingle food will be prepared for your pleasure. We are flexible and can offer a wide range of alternatives to suit every palate.